Florida State appeared to have buried No. 17 Miami. The Hurricanes trailed 27-7 with 11:52 remaining in the third quarter after a 74-yard punt return touchdown by the Seminoles’ D.J. Matthews. 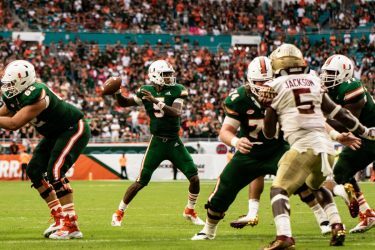 Miami forced three turnovers and scored 21 unanswered points including a game-winning, 41-yard touchdown pass from N’Kosi Perry to Brevin Jordan to defeat Florida State, 28-27, Saturday, Oct. 6 in front of a raucous 65,490 fans at Hard Rock Stadium. 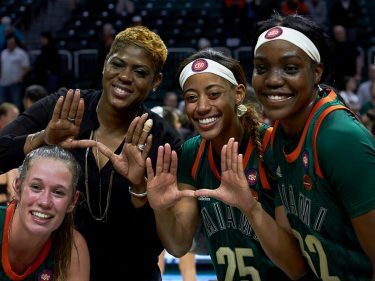 The victory was Miami’s first win at home over Florida State since 2004, snapping a six-game losing skid. The Hurricanes have won back-to-back meetings and lead the all-time series 33-30. First, safety Sheldrick Redwine bolted through Florida State’s offense line and stripped quarterback Deondre Francois. Fifth-year senior Gerald Willis III scooped up the loose ball to ignite the Hurricanes’ sideline. Perry connected with Lawrence Cager for a 3-yard receiving score, cutting the deficit to 27-14 with 4:53 remaining in the third quarter. Two plays later, the Hurricanes’ defense struck again. Pinckney picked off Francois to set up Miami’s offense inside Florida State’s redzone. With one throw, Perry pulled the Canes within one possession. 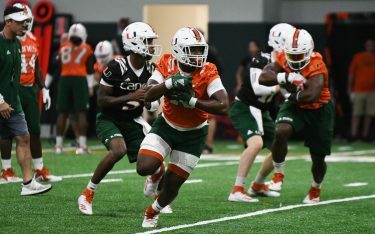 The redshirt freshman quarterback found standout receiver Jeff Thomas—who battled a knee injury throughout the game—for a 17-yard touchdown grab. Miami (5-1, 2-0 ACC) scored two touchdowns in a 42-second span, jumpstarting the elated Hurricanes faithful onto their feet. 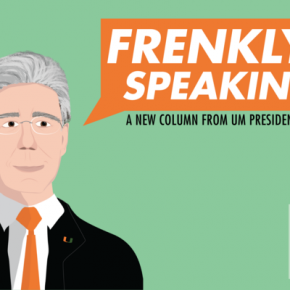 UM took its lone lead of the night when Perry heaved a 41-yard touchdown to Jordan over the top of the Seminoles’ defense. “The one to Brevin, that was the perfect look, the perfect play call for the defense they were in and it worked out perfect,” Perry said. The Ocala, Florida, native finished his second career start 13 of 32 for 204 yards and four touchdowns. Francois, who threw for 109 yards and two touchdowns in the first half, just tallied 20 yards after the intermission. The redshirt junior completed 15 of 30 passes and notched two touchdowns and one interception. The Seminoles (3-3, 1-3 ACC) seemed to regain the lead with a 39-yard touchdown early in the fourth quarter, but the officials called back the scoring sequence, flagging Matthews for an illegal forward pass on a trick play. Miami held Florida State to 200 yards and finished with six sacks, 12 tackles for loss and two forced fumbles. Preseason All-American safety Jaquan Johnson — who returned after missing two games with a hamstring injury — registered a team-high 10 tackles. “It feels amazing, especially with the slow start we had and rallying in the second half to get the W,” Johnson said. The Hurricanes next play on the road against the Virginia Cavaliers, 7 p.m. Oct. 13 at Scott Stadium.